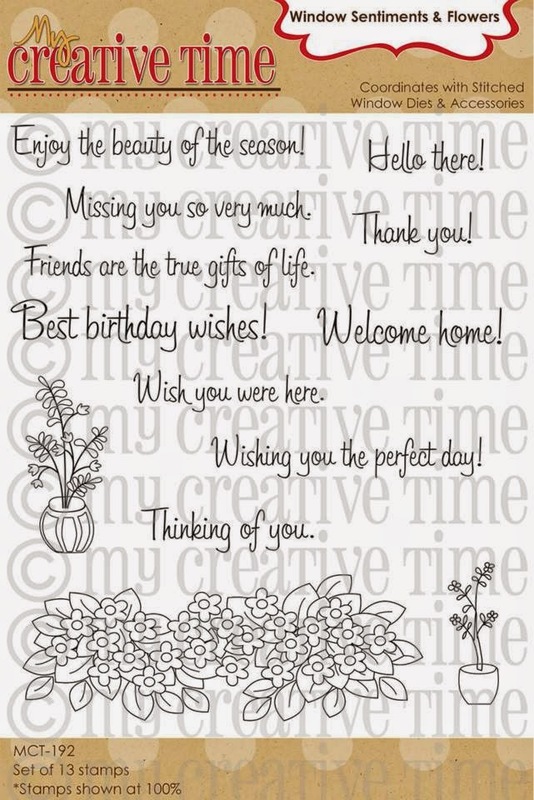 Welcome to the My Creative Time 38th Edition Release Blog Hop! If you just happened upon here, you might want to head over to Emma's blog, to the beginning of the hop. This is a very fun release, and I hope you are as excited about it as we are! I had fun creating a little scene using the new Stitched Window Dies & Accessories and the coordinating Window Sentiments & Flowers stamps for my card today. I used my Scor-Pal to score every 1/2" on gray cardstock to create some faux siding for my house. 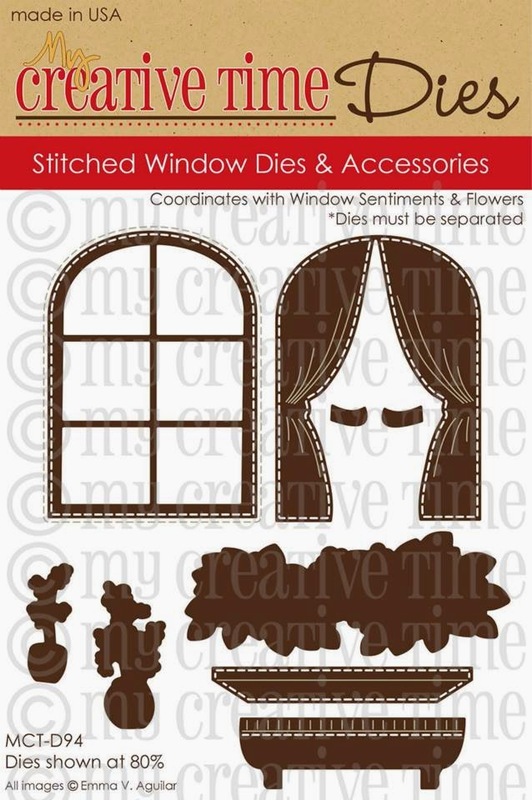 Don't you just love the cute little window, curtains, and planter box you can make with the dies? To make the flowers, I stamped the image on white cardstock with Memento Tuxedo Black Ink and then watercolored them. After that I was able to use the coordinating die to cut them out. I heat embossed my sentiment with white embossing powder. Here's a closer look at the new sets I used on today's card. They are all available for purchase now in the My Creative Time Store! 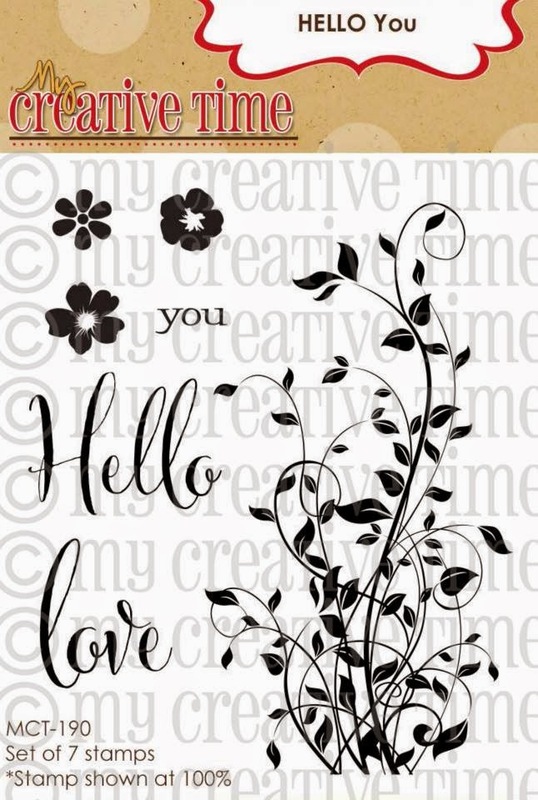 For our "Freebie" this month, we are giving away this ADORABLE stamp, "HELLO You," to the FIRST 150 shoppers! Yep, you head that right, this stamp will go to the FIRST 150 shoppers for FREE! You do NOT have to add it to your cart; Emma and her shipping crew will automatically include it in your package, but ONLY to the first 150 shoppers! IF you happen to come through AFTER the 150th shopper, no worries because this will be available for sale! Emma knows there will be questions on whether YOU made the first 150. After the first 150 shoppers come through, then you will see this set available for purchase along with the new release items! Also, DON'T FORGET our sale that is starting RIGHT NOW! Use the code NOV2014 to receive 20% off your entire purchase! This sale applies to "IN-STOCK" items ONLY. This sale will end on Friday, November 28, 2014 @ midnight PST. Your next stop is the super talented Lee-Ann! I love your card!!! That window die and stamp set is soooo cute! LOVE!!! love how you scored the black cardstock!! can't wait to get my items next week! This little window and flower bos is super adorable! Your card is so pretty Katie!! I love how you scored to make the siding!! Hugs!! Thank you for your AWESOME sneaks this week! OMG Miss Katie your card is so gorgeous gosh lovin the colors just look so royal and glamourous. Super great stamping and your water coloring is so fabulous. YOU so ROCK!! Super gorgeous card! Love how you scored the background to look like siding. Super cute card - love the window. I do love the cute window, curtains and planter box. I like how you made siding slats for the background. I can't wait to use these dies! Beautiful job. Katie, Your card turned out so beautiful! What a delightful new product release! Thank you for sharing with us hoppers/shoppers! That's a gorgeous card. I love how you scored the background, what a great idea. love ur colors and the added middle curtain swap, awesome idea!!! oh Katie, what a beautiful color combo. Love your card!! Great job!!!! Katie ~ Simply STUNNING and BEAUTIFUL! LOVE the coloring and oh my the choices of paper!! Love how you did your scoring too! As always AMAZING job!!! Pretty card! Love how those colors pop! What a lovely card Katie! Love your card. The flower box is so pretty. I can't wait to get my goodies in the mail, so I can create. Thank you for sharing. This is so pretty! I love your flower box! Lovely window design Katie. The color is pretty too. Very pretty card, love the window box and the curtains on the window. So cute. What a great project, I love the colors!!! Gorgeous Katie...love your window scene!!! Like how you made the sidling using your scoreboard. I LOVE your SWEET window card. Love how you created the siding. Thanks for sharing. AND heck yah I'm excited. I got the whole release for my birthday. tee hee hee. Amazing card! Love the dies and stamps! Beautiful card! The window dies and stamps have endless possibilities for creative ideas! Beautiful card!! Love those flowers!! Great job!! Love your card! Your watercolor flowers are amazing! the window set is on its way to me. Beautiful colors with this window scene. Your card is so beautiful Katie!! AWESOME job all week with this new release!!!!! Lovely card Katie! I love the scored "siding"?TFS! It's Your Day to Shine!